which he feels he can succeed." The Montessori Pathways School believes that before children can take advantage of a good education, they need to know how to learn. Only then can we aid children in the development of basic skills and the ability to judge, think and create..
Our school introduces the child to the joy of learning by providing a framework in which intellectual and social discipline can develop. When children learn how to think and reason, they can give intelligent responses. Montessori Pathways School provides a precisely prepared Montessori environment, which fosters satisfaction in learning by discovery and a joy in achievement. The climate and selected activities are prepared to interest and motivate the child and to protect him from unnecessary failure. 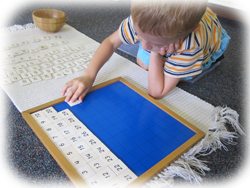 The Montessori materials develop basic problem solving and observational techniques. The child begins in the concrete and manipulative materials and gradually works toward the abstract. Montessori's recognition of the importance of a stimulating environment as a means of "freeing the child's potential" is now supported by a multitude of studies in early learning. These materials, together with highly trained teachers and administrators, provide a classroom where the child is stimulated and challenged, but never pressured. In such a climate the child learns to feel good about himself. His right to dignity and worth are protected. The role of the Montessori Teacher (Directress) differs considerably from that of a traditional teacher. She observes and assists the child according to the child's individual needs and interests. She is trained to recognize periods of readiness and to demonstrate the correct use of the material to the children. She reinforces in a positive manner. At times she may encourage a hesitant child. At other times, she may divert a child who chooses material beyond his ability. She protects the child's integrity and allows the child to have the freedom of choice to make decisions. The child's decisions are expected to reflect a sense of responsibility. He is helped by the Directress' manner, which is firm and consistent, yet patient and gentle. We welcome you to Montessori Pathways School and encourage you to observe for yourself what makes our school so special for your children.